And still news of June sales continues to arrive as a call to Sue Grant at Berthon International confirms the sale of the 24.4m sailing yacht Nimrod and 24.4m motor yacht Blue Legend. Nimrod is a custom built fast cruising yacht designed for shorthanded long term cruising with accommodation providing luxury for six guests in three en-suite staterooms. Nimrod was composite built to the most exacting standards in 2000 by Marten Yachts, New Zealand. 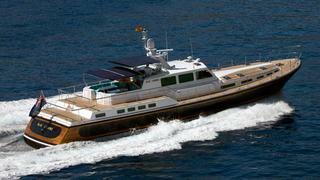 A joint listing with Ancasta, Nimrod was asking €1.1 million. Then there's Blue Legend: the largest motor yacht delivered by Nelson, she was built in 1996 with a total rebuild in 2006. She was in immaculate condition with excellent seakeeping abilities. Asking £2.25 million, the buyer of Blue Legend was represented by Floating Life.